I’m not sure how many people have a “why” behind their spiritual beliefs. For many years I certainly didn’t see a need to explain myself. I felt what I felt, I experienced what I experienced, and that was the whole of it. This has changed of late, as I am pulled towards a greater effort at self-exploration and discovery in the wake of experiences that revealed the depths of my tendency to take on the personalities and beliefs of those closest to me. I believe that much of what draws me to various forms of “pagan” practice is the same pull I feel towards my life as a scholar. I seek something beyond the mundane: a quest, a purpose, I might even go so far as to describe it as a hunt. With texts, research becomes my path, one encounter revealing a new trail that I can follow, using what knowledge and skills are available to me in order to successfully track that lone bit of information that eludes me. With the spiritual, I have found something of an adventure in the search for personal truth. The prospect of a new lesson from guide or god genuinely excites me. I envision myself straining against the harness of my daily tasks in order to get to the next moment when I might close my eyes in meditation, or lift myself into a higher mental and emotional place while sitting in shrine, just to experience, however briefly, something which will make me better than that which I was before. Adventure is the chance for growth, and thus I loathe the stagnancy of the secular, standard, American day to day. Give me change, give me a quest for greater understanding, allow me to move, to run, to lift my face to the sky and catch the scent of something new to chase, something to work for. It is a uniquely visceral need for me, and one that I am only beginning to fully recognize. So much of it ties strongly to my emotional well being. I feel that this constant desire occasionally leads much of my spiritual life to fall within the domain of sensation and experiential knowledge rather than the in-depth research that many of my most respected friends and acquaintances often write about in their own posts. I feel some conflict there: as an academic myself I feel as though I should be spending less time being and becoming and more time educating myself in the methods through which I live and shift. I do not understand why I am not more inclined to make the time for such research, particularly given the mental associations of “a quest for knowledge” and the “vitality of the quest” which I mentioned earlier. To some degree I must acknowledge that there are only so many hours in a day, but it likely merits further consideration as to why, even in this post which challenges issues of the mind within my spiritual development, I am largely writing about my emotions. But however I decide to pursue my spiritual “adventures” down the road, through book, through sensation or through a better balance of the two, I recognize that I do have an overarching structure the “why” of my beliefs. To some I suspect it might evoke the concept that I am charging at windmills for lack of ability to face reality. They may deem it such if they wish. In the meantime, I’ll continue to pursue my quest. This would be a picture of the top of my head. Aside from the faded red near the edges, most of what you’re seeing is my natural hair. 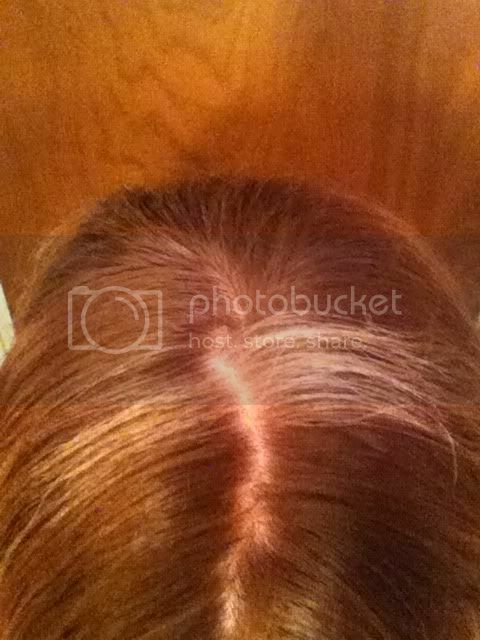 Plain old brown, with a brilliant white streak stemming from the very center of my skull. It was a white-blonde in my earliest years, shifting to a pure white sometime in late elementary school. In those years, as children so seek out difference like moths to a flame, I was dubbed “old maid,” “weirdo,” and sporadically “witch,” for my strange little streak. I hated it. Always combed my hair in such a way as to hide it, and when my parents finally permitted me to dye my hair at the age of sixteen, I pounced at the opportunity, begging the woman who completed the task to put extra layers over my strange colorless patch. …Okay, so why am I writing about my hair of all things in a spiritual blog post on authenticity? My spiritual life and my “actual” life, we’ll say, have always been very separate. The paths that have clicked for me, an individualized form of shamanic practitioning and Kemeticism, tend to be something I do on my own and share with trusted, like-minded individuals on the internet. The folks who know me in real life, up to and including my previous significant other of four years, did not fully understand who I am and what I believe in. To them, for many years, I felt that I presented an inauthentic form of myself, the outermost obvious layers only. For some, this was and remains a necessity. I cannot share my beliefs in my work setting: academia frowns on most forms of spirituality. I cannot share all of my beliefs with my family: it would cause a tremendous amount of discord, far, far more pain than I presently bear in keeping things to myself. But to the general public, and certainly to those I wish to allow to be close to me, why did I maintain this duality of existence? I have white streaks on the inside. I hear mental voices which I interpret as gods. I travel to other worlds within my mind, mental state altered by the repeating sound of a pounding drum. I readily acknowledge that I could stop believing in these things, but I choose not to. They are a part of me, they enrich my life, help me to better understand myself and my world. I do not wish to let them go in the name of sameness and neutrality, and so I won’t. I’ve started talking with my current partner about my spiritual life. I’ve found it to be genuinely terrifying; I constantly expect him to deem me crazy and leave. And yet, he doesn’t. In a little under a month I will be attending the House Kheperu Open House, interacting with pagans and ‘kin and all sorts of folks who believe in the Unseen; I expect to be overwhelmed at the clashing of my realities. And yet, I will love it. I intend to slowly allow myself to be me more openly, in my appearance (Kemetic jewelry, natural hued, curlywild hair), in my words (trying to be more open with trusted friends about my paths), and in my mind (ceasing my incessant self-disparagement, and loving who I am in the moment I am living). I want to be authentically me. Bridge the gap as best as I can between all aspects of my life. It’s a daunting challenge, but I feel the fierce, beautiful support of my spiritual Family, and I know that I will get there. In time.